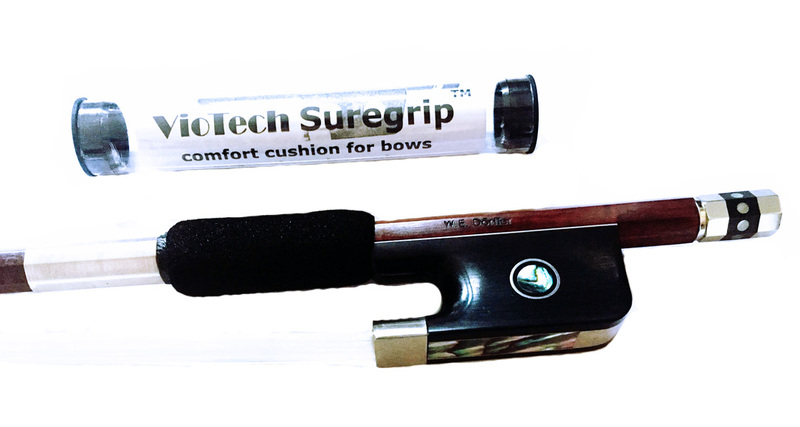 VioTech Suregrip foam bow cushions are available for violin/viola and cello. Simple to use and easy to fit; VioTech bow cushions can help with a secure and comfortable bow hold while helping to protect your bow. They are made from a neoprene foam and are black in colour. The cushions are available in sets of 2 cushions per tube: One size for Violin/viola and one size for Cello. 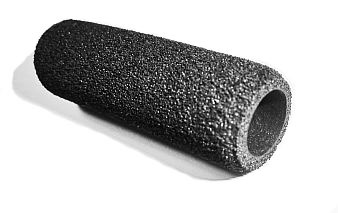 VioTech bow cushions fit the majority of bow stick diameters. The VioTech cushion can be rotated then reversed to maximise longevity. It can also be moved down the stick towards the frog to take up hair stretching and protect the stick. 1. Remove the bow frog and apply a miniscule amount of silicon grease, washing-up liquid or petroleum jelly lubricant inside one end of the cushion. 2. Push the cushion on to the stick and ease it gently up towards the leather grip. The thin leading edge may tuck under so ease the lip over the existing grip by flicking it up carefully with your fingernail. 3. Continue to ease and push the grip along the stick. You might find the cushion tends to compress a little. Once the grip is in place ease it back a little the other way to achieve full length. Then adjust it to the correct position for you. 4. Replace the frog, taking great care to align the screw correctly.